For my final project, I chose to make an English medieval long bow. I have always been interested in bow and arrows so I was excited for the opportunity to try to make one. I first started out by researching how the English made their bow and arrows in medieval times. The wood used for the most part was Yew, but Yew is very expensive and I did not want to spend hundreds of dollars on a piece of wood. So instead I went to Home Depot and bought a plank of Oak wood for about 9 dollars. I decided to not use any power tools because they would not have had power tools back when the English were making these long bows. So the first thing I did with my plank of wood was measure out the dimensions of each part of the bow. I decided to have a five inch handle, with a 2 inch fade on each side and then twenty eight inches on each side of the bow. This was a pretty good representation of how long the bows that the English used were. I cut the wood down to the length I wanted with a hand saw and after that, I began whittling down the wood so that it was thin enough to bend. The whittling process took a really long time. Oak is a very hard wood and whittling it takes a lot longer than wood like Redwood. Finally after hours of whittling, I whittled the wood down to the shape and width I wanted. The next step was to sand the wood down. So I got sand paper and sanded the entire bow to a nice smooth finish. I then took my knife and cut notches in the bottom and top so I could tie the string around each end. I got the bow string from an outdoor sporting store. In medieval times, they would have used dry reed. I didn’t have reed so I just bought a bow string. After the bow was basically finished, I decided to stain it with wood stain. Obviously they wouldn’t have stained the bows that they made back in medieval times, but I thought that the bow would look better stained. I am really happy with the way it turned out. I think that this bow is a good representation of how big English long bows were. I am interested to see if the bow is able to shoot the arrow I made for it, but because it is Oak I don’t think it is bendy enough to shoot. I had a really good time making this bow, and I think that the bow turned out really nice. My finished Bow and Arrow. Alensq. “Making a medieval style English longbow.” . N.p., n.d. Web. 25 Apr. 2014. <http://www.instructables.com/id/Making-a-medieval-style-English-longbow/&gt;. “How to Make a Composite Longbow.” wikiHow. N.p., n.d. Web. 25 Apr. 2014. <http://www.wikihow.com/Make-a-Composite-Longbow&gt;. 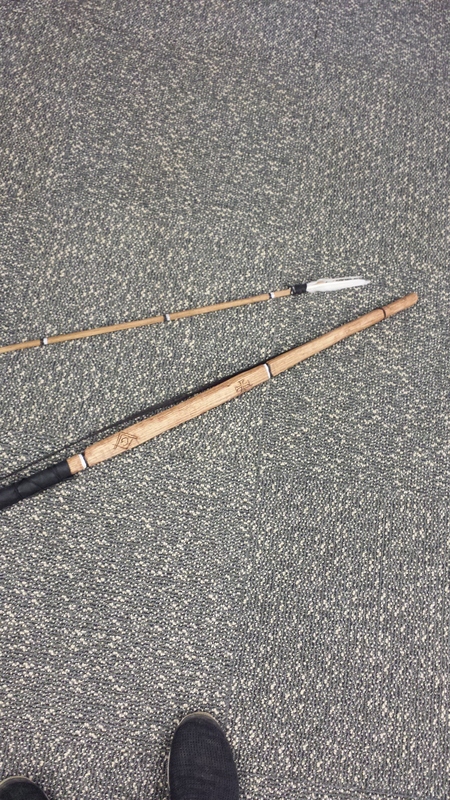 “How to make a high performance longbow for under $10. #1.” YouTube. YouTube, 8 July 2011. Web. 25 Apr. 2014. <https://www.youtube.com/watch?v=bjiPXuuKFa4&gt;. Turgeon , Tom. “.” How to make a Longbow. N.p., n.d. Web. 25 Apr. 2014. <http://www.wwgoa.com/build-your-own-long-bow/&gt;.